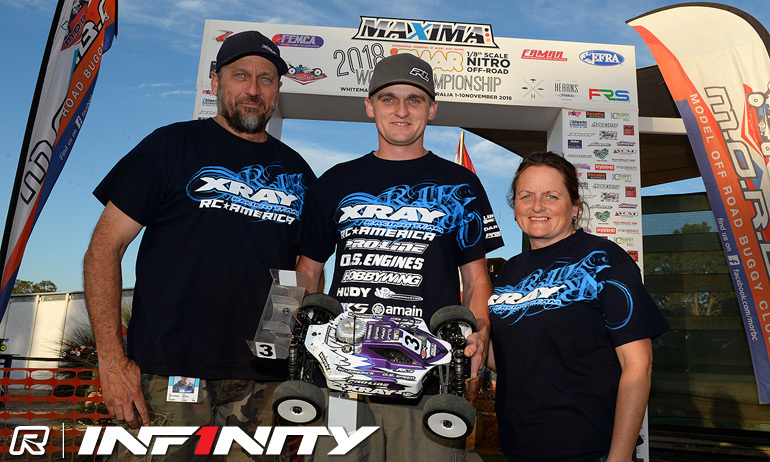 Ty Tessmann is the Top Qualifier at this year’s 1:8 Offroad World Championships in Perth, Australia. The former champion took qualifying’s top prize with the second fastest time in the final round of qualifying behind Davide Ongaro to deny defending Champion David Ronnefalk by a single point. While Ongaro took Q6 by a considerable margin of almost 8-seconds, as the only one who could knock Tessmann off the top of the qualification ranking, Ronnefalk didn’t have the best of runs and needing only a Top 4 for the round to take the overall TQ ended up with a P5 leaving with 8 points compared to Tessmann’s 7. With four of the six rounds of qualifying to count Ongaro’s second TQ run allowed him to drop a 16th from Q3 to end up 3rd overall. Concluding qualifying with a P4 behind Spencer Rivkin, Ryan Maifield would move up to fourth in the final ranking ahead of Mugen team’s Robert Batlle with onroad star Naoto Matsukura completing the Top 6.